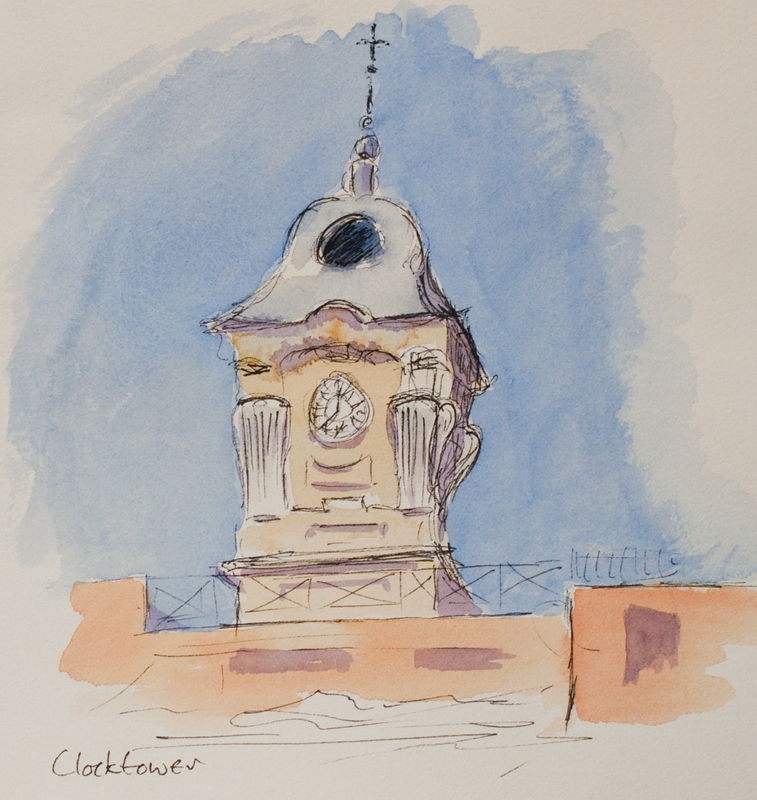 Here’s a watercolour sketch which I tried to do at speed, having first had a go at a more detailed (stilted?) rendering. You’ll find a photo of the scene on the Italian Journey page. The Venerable English College is Rome, which made me very welcome, is situated on an historic. In fact, they are due to celebrate next year the 650th anniversary of english presence in the site. 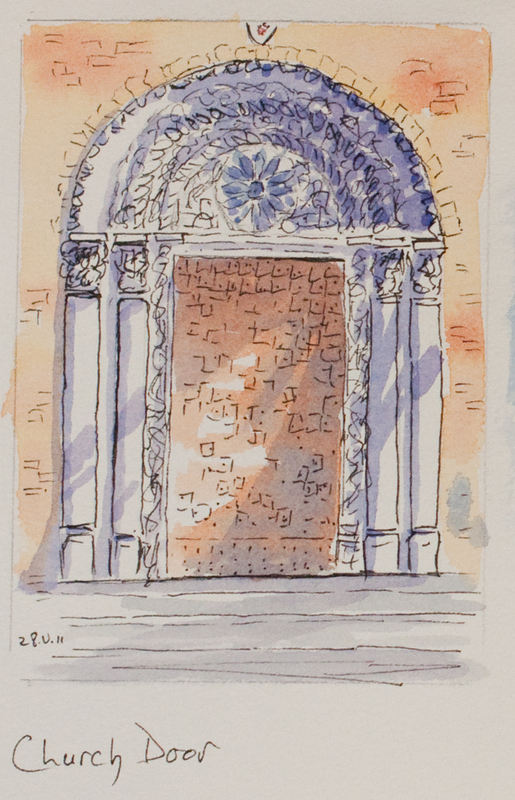 The present building isn’t that old, but it has a beautiful church which in turn has an impressive door – which always seems to be closed, as people enter it through the main college entrance. The college also boasts an impressive clock tower. The clock chimes every quarter of an hour and you can tell the time from the chimes without needing to see the clock. One ding to four dings takes you from a quarter past the hour to the full hour and then the hour is chimed in dongs – and this every fifteen minutes. Considerately, it stops between 10.00pm and 8.ooam – as well as between 2.00 and 4.00pm for a siesta – how civilized! Here’s a different approach to the classic view of Florence. 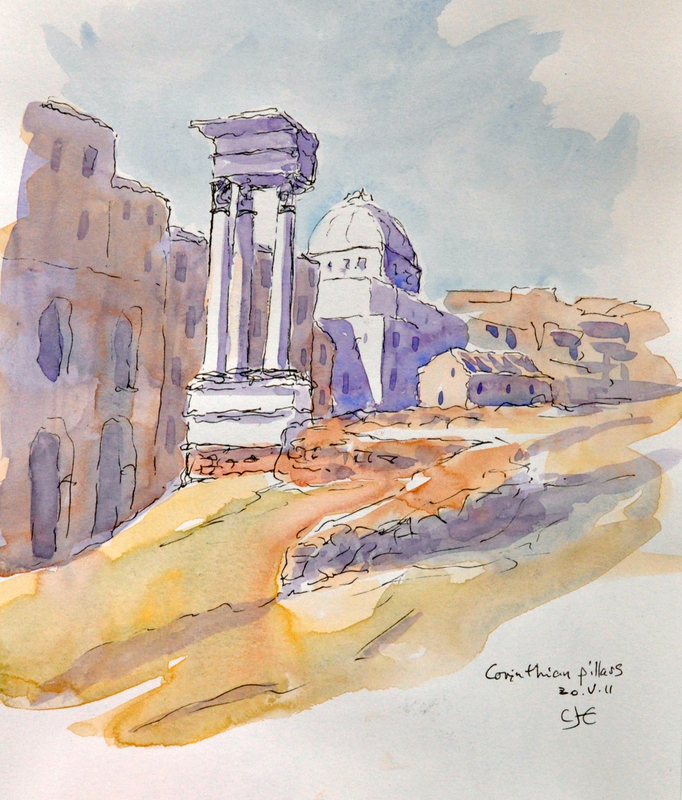 Again, it’s a pen and wash sketch – painted from a photograph from my last visit. I was, at this stage, looking forward to having a go on location. And so the day came. 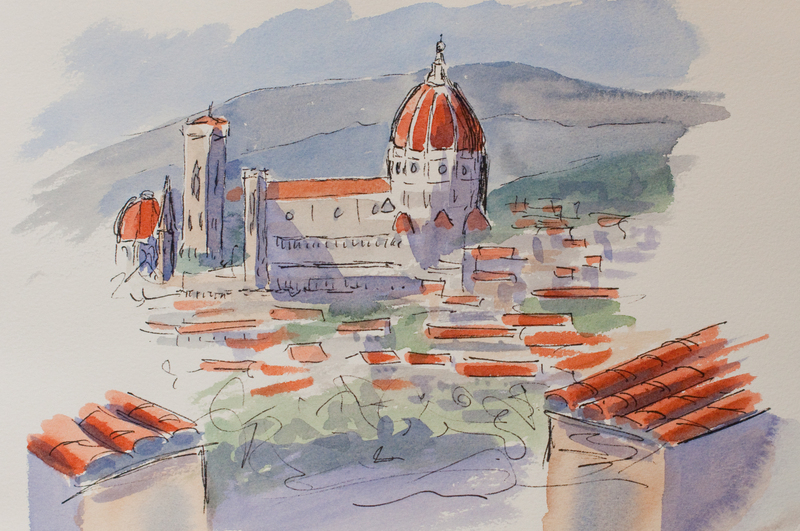 In my Italian Journey page I mention that I spent much of 2nd June at the Piazzale Michelangelo sketching and painting the views over Florence. I’ve put my quick pen and wash of the Ponte Vecchio there, but here is the preliminary monochrome pen and wash of the Duomo. 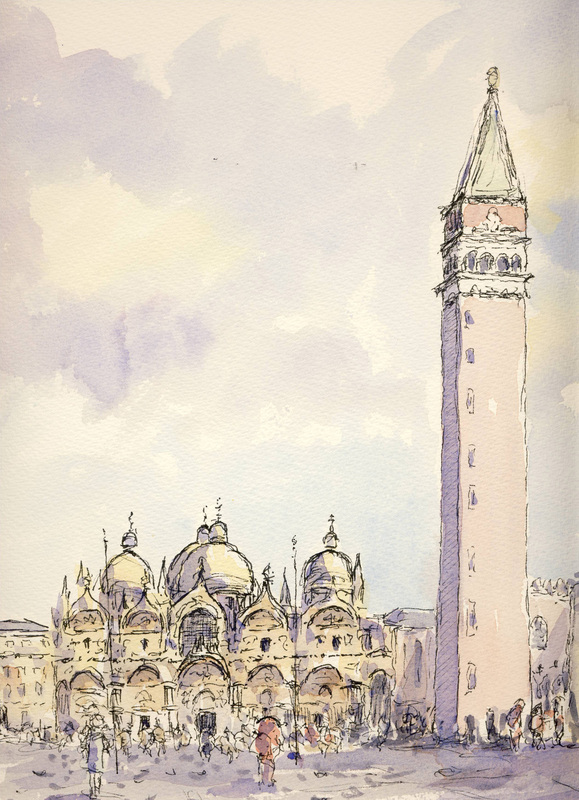 And next is the watercolour which followed it. 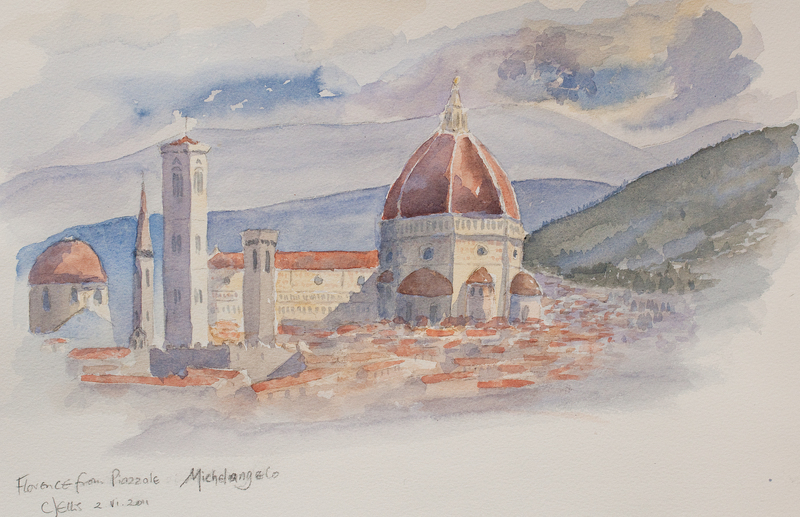 I’m quite pleased with the treatment of the roof-tops going into the distance – but the Duomo itself is really difficult to paint as a united and subtly shaded structure – and getting Brunelleschi’s dome right is a nightmare!